Better than expected data in the US: manufacturing has moved up to 52.8 points, reflecting stronger growth. Also the unemployment component, which is eyed towards Friday, is back to growth territory with 51.7 points. The US dollar is slightly stronger across the board. New orders rose to 52 points and prices paid made a big rebound from the lows: 49.5, almost at the barrier between growth and contraction, after hitting 40.5 in April. Also construction spending, released at the same time, impressed with a rise of 2.2%. This was more than triple the expectations for +0.7% and on top of an upwards revision of the previous data to a gain of 0.6% instead of a drop of 0.5% originally reported. Earlier, Markit’s manufacturing PMI was upgraded to 54 points from the initial assessment 53.8 points. However, US data did not excel beforehand: the core PCE Price Index rose only 1.2% year over year. 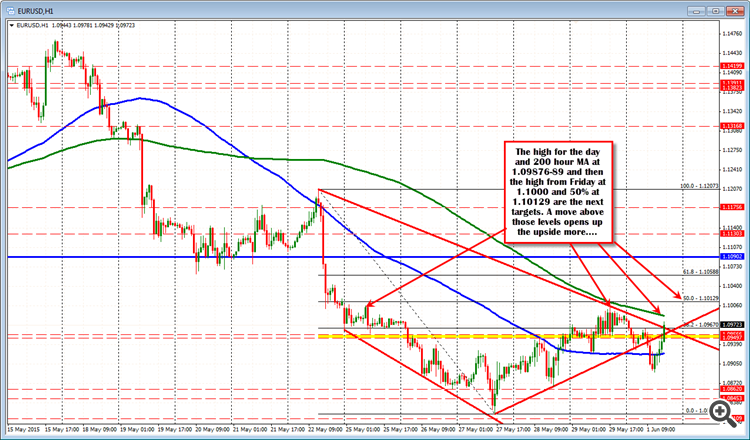 The EURUSD could not keep a lid on the pair at the 1.0956 level. Sellers relented and buyers took more control. The price has now moved above the European highs and looks towards the high for the day and the 200 hour MA as the next targets (at 1.09876-89). The high from last week at 1.1008 and the 38.2% of the move down from the May 22 high comes in at 1.10129 become the next targets. Mounting concern about Greece’s future is taking a toll on the euro — and yes, the dollar is benefiting from that — but an aggressive rally in the greenback is unlikely while U.S. data remains weak, analysts said. “Gold is still cheap relative to fixed income [assets]…gold could really pop and move,” said Nicholas Johnson, who helps manage $20 billion invested in commodities at Pacific Investment Management Co.
Mr. Johnson wagered that gold prices would rise while 10-year Treasury inflation-protected securities, which had rallied this year, would pull back. The price of 10-year TIPS is up 2.52% this year, according to data from Tradeweb, while gold prices are up 0.4%. Investors buying gold aren’t expecting another global recession. Instead, they say that years in which gold was passed over for other assets has pushed the metal’s price too low, and now it is ripe for a rebound. Gold prices tumbled 29% in 2013 and 2014, a selloff driven largely by the Federal Reserve’s exit from its post-financial-crisis stimulus measures and expectations for a rise in interest rates. [AUD - Cash Rate] = Interest rate charged on overnight loans between financial intermediaries. Short term interest rates are the paramount factor in currency valuation - traders look at most other indicators merely to predict how rates will change in the future. "The Federal Reserve is expected to start increasing its policy rate later this year, but some other major central banks are continuing to ease policy. Hence, global financial conditions remain very accommodative. Despite some increases in bond yields recently, long-term borrowing rates for sovereigns and creditworthy private borrowers remain remarkably low." "Having eased monetary policy last month, the Board today judged that leaving the cash rate unchanged was appropriate at this meeting. Information on economic and financial conditions to be received over the period ahead will inform the Board's assessment of the outlook and hence whether the current stance of policy will most effectively foster sustainable growth and inflation consistent with the target." "The chart notes indicate a greater likelihood for another dollar rally higher, and an additional reason comes from the base out of which this fiat paper currency has rallied. You can see how the “dollar” index has been in a base trading range (TR) since 2006, on this chart, and said base provides the impetus to carry price much higher than has developed, to date." "Higher time frame charts are for a truer reflection of market context and direction, for it takes considerably more time and effort to change the direction of monthly, and even higher time frames, to change. Charts can be like a mosaic where you can see something unseen from one viewing to another. We attribute this to the fact that when one makes a presentment of a particular point of view, that view takes on a bias, and that bias will block out information that does not support what is being presented. This point of view may be too in-house, but there is a sound basis for it. The fact that price has not rallied higher since the December swing low, coupled with a demonstrated inability to break overhead resistance [horizontal line], keeps the December low in question and positioned to be broken. Too soon to tell but something of which to be aware." "The euro is knocking on the door of an old resistance level at 1.1040. It's pretty tight around here and 1.1050 and a break above could well see us having another look at the may highs." "We've just nudged through 1.1050 to 1.1056 as I type but have quickly dropped back below." "The Greek news is driving the price and the story from the WSJ is yet another that gives us the impression that something is coming close. As I mentioned in that post though, it is only something coming from one side of the table and the Greek still need to decide on it. The chances are that both sides are now tinkering around the edges of a deal rather than facing any big impasses that they had previously "
"While, the government of Greece negotiates with its creditors, customers are abandoning Greek banks in droves as doubts over the country’s economic future grow. In the last three days or so, a staggering €800 million (£570 million) has been pulled out of Greek banks, sparking fears of a major bank run. Fearing a total financial collapse, savers have been pulling cash out of their bank accounts and the government has struggled to make benefit payments. According to data from the European Central Bank, Greek bank deposits are now at their lowest level since 2004, falling to $198.89 billion from more than $242 billion just five months ago." 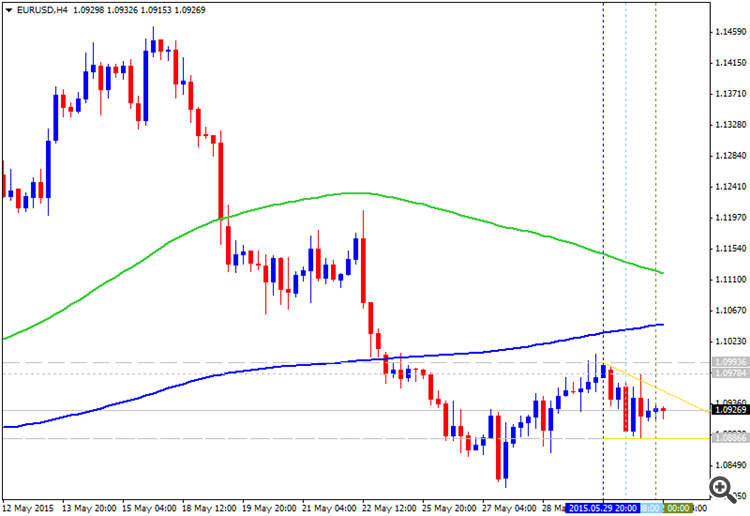 "EURUSD has rallied today on the headlines and is currently testing the 100 day MA which comes in at the 1.1082 level. The pair has moved through the highs from March at 1.1052. This is now a level to get back below if the bears are to take back control. The swing low from Jan comes in at 1.1097. This area between 1.1082 and 1.1097 should be a tough resistance area." 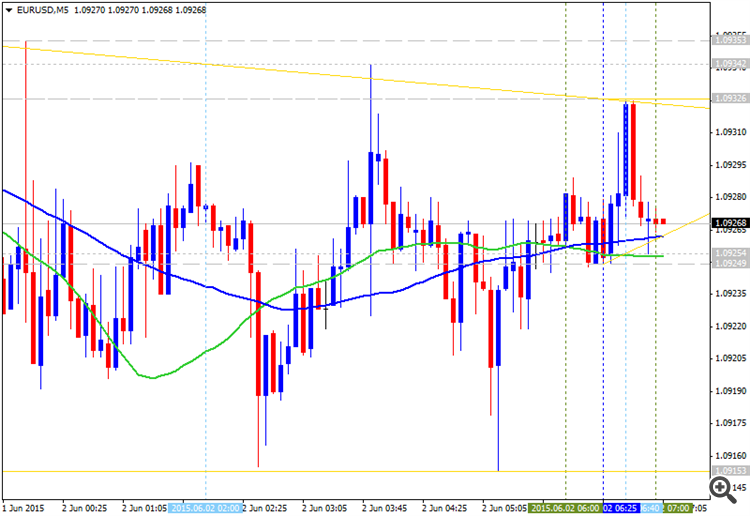 Forex technical analysis: EURUSD rises on Greek deal. We have been down this road before. The Euro advanced against the US Dollar as expected after putting in a bullish Morning Star candlestick pattern. Near-term resistance is at 1.1202, the 38.2% Fibonacci expansion, with a break above that on a daily closing basis exposing the 23.6% level at 1.1320. Alternatively, a reversal below the 1.1005-1.1055 area (horizontal pivot, 23.6% Fib) clears the way for a test of the May 27 low at 1.0818.